Ralph saw very little of Isabel during the next three or four years. He had expressed his opinion of her marriage, and after this held his peace. Their conversation had made a difference, and it was the difference that Ralph had feared, rather than the one he had hoped for. His arguments had had no greater effect upon her in causing her to change her plans than had the argu­ments of Caspar Goodwood, Mrs. Touchett, or even her old friend Henrietta Stackpole, who also wrote opposing her marriage to a man Miss Stackpole felt was hardly worthy of her. No mention was ever made again of Ralph’s opinion of Gil­bert Osmond, and by surrounding the subject with a deep si­lence he and Isabel managed to keep up an appearance of their old friendship. But there was a difference, as Ralph said to himself—there was a difference. Accordingly, in June of the same year Isabel married Mr. Osmond. The marriage was a very simple affair and took place in Florence in a small American church there. Only a few people attended: Mrs. Touchett and Ralph, Pansy Os­mond, and the Countess Gemini. Madame Merle had been in­vited, but Madame Merle was unable to leave Rome at the time and wrote a polite letter of excuse. Henrietta Stackpole did not attend because she was in America at the time. In her usual direct manner, she wrote saying that, had she been able to cross the Atlantic, she would have been present not only as a witness but also as a critic. For the next two years after this, Ralph did not see Isabel even once. The immediate winter following her marriage he spent in San Remo and was joined there in the spring by his mother, who then accompanied him to England where they spent the summer and early fall together. The next winter Ralph went directly to San Remo again, where he now had his own house, and only in April of the following year did he come down to Rome, where Isabel and Osmond had moved shortly after their marriage. They had taken a large house in the very center of Rome and established themselves there in a fairly elegant manner. Ralph was now very curious to know what Isabel was making of her life. He had asked his mother about this and she had an­swered that she supposed Isabel was making the best of it. Isa­bel had written to him from time to time, but her letters told him nothing he wanted to know. So at last he had decided to go to Rome and see for himself. He knew that, having expressed himself as he had done about her marriage, he had put Isabel on her guard and she would be too proud to admit it even if she were having difficulties—but he wished to see her again any­way. Just as he had expected, Isabel showed him very little of her emotions. There was something fixed and mechanical about her manner which was not completely natural. She had had a child which died several months before—just six months after it was born—but she hardly spoke about this. Possibly there was more to say about it than she cared to say to anyone. She was friend­ly enough toward Ralph, but, for various reasons, he felt she was not the same Isabel of old. As regards general appearances, she seemed to be leading a life of the world. Ralph heard it said that she enjoyed “a charming social position.” She was, as al­ways, the envy of many women, and it was considered a privi­lege even to know her. Her home was not open to everyone she entertained only one evening a week. She also lived with a certain elegance, though you needed to be a member of her own circle to observe this; for there was nothing to stare at, nothing vulgar or in poor taste in the daily lives of Mr. and Mrs. Osmond. Ralph, in all this, recognized the hand of the master. He knew that Isabel had no talent for studied effects. She was more a person of instinct. She loved change, movement, late hours, long rides; she preferred to be entertained, to be interested, to make new acquaintances; to see new people, even to be bored. Of old, she had been curious about everything. Now, as though living according to some strict plan, she was indifferent. She was slender still, and even more attractive physically than ever. But otherwise there were deep changes which Ralph did not find exactly to his liking. She even dressed in a different fashion now, more elegantly but more stiffly. Poor, human-hearted Isabel, Ralph thought—what has hap­pened to her? The free, spirited girl had become quite another person. What Ralph saw was the fine lady who was supposed to represent something. What did Isabel represent? Ralph asked himself, and could only answer by saying that she represented Gilbert Osmond. “Good Heavens! What a purpose in life!” he said to himself sadly. He was lost in wonder at the mystery of things. Ralph remained in Rome for only a month and then left. He felt that Gilbert Osmond, who treated him with respect but coldly, had begun to resent his seeing Isabel. Then too, the weather in Rome happened to be cool, his health would not permit him to stay longer. Ralph’s health, of course, had grown steadily worse. In fact, on each of Isabel’s visits to the hotel where he stayed while in Rome, she wondered what kept him alive. She decided it was his love for conversation—his con­versation had been brighter than ever. He had completely given up walking, which used to be his only form of exercise, and now sat all day in a chair, depending, almost like a blind per­son, upon what others did for him. Clearly, Ralph had not long to live, yet what kept him alive was not what Isabel supposed. It was simply that he had not yet seen enough of the one person in the world in whom he was most interested; he was not yet satisfied. There was more to come; he couldn’t make up his mind to lose that. He wanted to see what Isabel would make of her husband—or what her husband would make of her. This was only the first act of the play, and he was determined to see it through to its climax. His decision in the matter held good, for it kept him going an­other eighteen months, and then he returned to Rome on a second visit—this time in the company of his old friend, Lord Warburton. Isabel first learned of this second visit of Ralph’s when Lord Warburton came to her home one evening to call upon her. It was an evening when she was entertaining guests but happened at the moment to be standing alone. Lord Warburton was ad­mitted by a servant and went directly toward her. She was nat­urally surprised to see him. in her mind for a possible explanation of his visit. “Do you know you’ve changed a little?” said Lord Warbur- ton. “I think I need not hesitate in saying the same to you,” Isa­bel bravely returned. Warburton went on. They sat down and Isabel asked him about his sisters, and about other matters of a general and social nature. He an­swered her questions as if they interested him, and in a few minutes she saw—or believed she saw—that he would no longer be embarrassing to her. Time had breathed upon his heart and, without chilling it, had apparently relieved it of the feeling it once bore toward her. His manner was now that of a contented man who would rather want people, or want her at least, to know him for such. In this connection, Isabel had heard that he had had considerable success in English politics within re­cent years and was now one of the more important men in the English House of Lords. A. 1. Why was there a difference in the friendship between Isabel and Ralph? 2. Why did Henrietta Stackpole oppose Isabel’s marriage? 3. Where and when did the marriage take place? Who was present? Who was not present? 4. Why didn’t Ralph see Isabel for two years after this? 5. Where had Isabel and Osmond moved? 6. Why did Ralph decide to visit her in Rome? 7. What had happened to Isabel’s child? 8. Why did many people envy her? 9. What was the Osmonds’ style of living? Whose hand did Ralph see in this? What was happening to Ralph’s health? 10. What was keeping Ralph alive? 11. When did Ralph next return to Rome? By whom was he accompanied? 12. According to Isabel, in change? “Brought Ralph with you?” Isabel’s surprise was great. “I’ll go to see him,” she immediately said. “I’m as fond of Ralph as ever,” Isabel answered. “But why has he come to Rome?” Her words were gentle, the question a little sharp. “He was completely alone there; the thick walls were his only company,” said Lord Warburton. “I saw him on occa­sion, and he was not happy. Three weeks ago I found him very sick. He has been getting worse every year, and now he has hardly any strength left. He had got up an artificial climate all right—the house was as hot as Calcutta. But he had suddenly taken it into his head to start for Sicily. I didn’t believe it— neither did the doctors. His mother, as I suppose you know, was in America, so there was no one to prevent it. He said he would bring the servants along, but in point of fact he hasn’t brought anyone. I wanted him at least to go by sea, but he said he hated the sea and wished to stop here in Rome. I finally de­cided to come with him—to look after him, as it were. “I sometimes think he is dying,” Lord Warburton said. He checked her; he was a little taken back by the quick ef­fect of his words. “I don’t mean I thought so tonight. You can go tomorrow,” he said. There was no need of Isabel’s stating that she would act upon Lord Warburton’s information, as she sat there, like some wild bird held back. 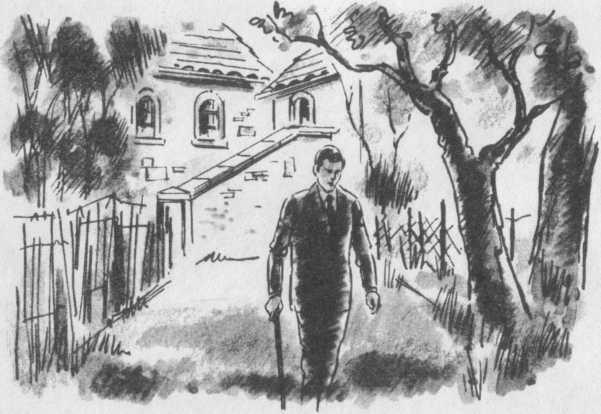 The following morning, as early as she knew Ralph’s late rising habits would permit, she went to see him. She spent an hour with him; it was the first of several visits. Gilbert Osmond also called on him, and on their sending their carriage for him, Ralph came more than once to Palazzo Roc- canera, as the Osmonds’ house was called. Several weeks passed, at the end of which Ralph mentioned to Lord Warbur- ton that he thought after all he wouldn’t go to Sicily. “Won’t go to Sicily? Where then will you go?” asked Lord Wart urton. “Wt 11,1 guess I won’t go anywhere,” Ralph said. “Ah, you ask too much,” said Ralph. “I suspect we’ve each been playing our own little game,” said Ralph quietly, with a rather curious expression on his face. “Perhaps I do,” said Lord Warburton a little gravely. Then he looked up at Ralph and just the faint suggestion of a smile appeared on his face. In truth, the two men had traveled to­gether for two weeks from London to Italy without mentioning the one matter that was mainly in the mind of each of them. Now it seemed established that y had both come to Rome with the one purpose—to satisfy their curiosity about Isabel. Ralph’s curiosity was known and of long standing. Lord War- burton’s was perhaps less easily explained. Possibly he only wished to assure himself that he was no longer in love with Isa­bel. It had taken him a long time to forget her; he had tried travel and various other means at first, in order to turn his mind in another direction. Then time itself had brought him the usual relief. He was happy now to discover that it no longer pained him to see Isabel personally, or to think of her as married to another man. He went often to Palazzo Roccanera and became a regular guest at Isabel’s Thursday evening gatherings. He even got to know Gilbert Osmond well. The two men got along very well together. Naturally, it was not difficult for Mr. Os­mond to welcome within his private circle so distinguished a visitor as Lord Warburton. He made the latter acquainted with ^ his daughter Pansy and was pleased when Lord Warburton be­gan to show more than a casual interest in her. Pansy Osmond, it should be explained, was now a young woman of nineteen years of age. She had grown up to be very pretty and attractive. She perhaps lacked what is best described in a woman as style. She was small and serious; her manner of dress was not modern, not conscious. In her stiff little gowns she often looked as though she had just stepped out of one of the old paintings on the wall. At the same time, this gave her a kind of Old-World charm which was very engaging. Lord Warburton, as well as other men, found her very attractive. Lord Warburton’s interest, in fact, soon took a romantic turn. He did not force his attentions upon the girl but simply let it be known that he found Mr. Osmond’s daughter very charming. His friends were naturally very much confused. Was he seri­ously interested in Pansy, or was he attracted to her only by reason of the fact that she was so near to Isabel? Lord Warbur­ton himself simply knew that he enjoyed visiting Palazzo Roc­canera, talking with Isabel, and at the same time observing the delicate manner and movements of the young girl who was gen­erally at Isabel’s side. Pansy Osmond and Isabel had grown quite close in recent years. Isabel had made it almost an article of faith to treat her stepdaughter with kindness and affection. In this one phase of her marriage at least, she had succeeded well. She and Pansy were almost always together. During the second and third winters at Palazzo Roceanera, when Pansy started to go to parties and to dances, Isabel had begun to ac­company her. She found that she liked Pansy’s company, it had the effect of bringing a note of color into her life. She began to take Pansy with her on her daily walks and rides through the city, and in this way a deep and satisfying affection had grown up between the two. A. 1. What did Lord Warburton tell Isabel about Ralph’s health? 2. How had Ralph been living recently? 3. Why had Mrs. Touchett gone to America at this time? 4. What did Isabel do the following day? 5. What reason did Ralph give for not going on to Sicily? 6. What was the real reason that both Ralph and Lord War­burton had made the trip to Rome? 7. How did Lord Warburton now find that he felt about Isabel? 8. How did Lord Warburton become interested in Pansy Os­mond? 9. Describe Pansy Osmond at this time. 10. How did Isabel get along with her stepdaughter?